Many of you know of Helen’s work. As a former Oregonian she was a regular at gallery events, plus we’ve carried Helen’s work in gallery inventory for many years. She has written several paper how-to books, the most recent serving as timely inspiration. Purchase Helen’s book on her web site and be sure to subscribe to her Sunday Paper email newsletter—a must for all fans of paper art. 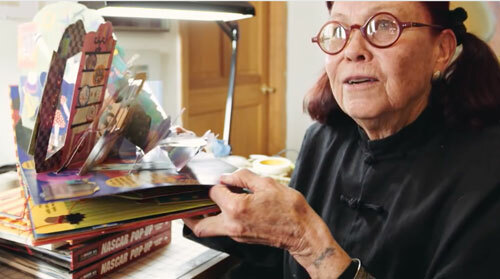 A delightful video starring world-renowned paper artist Sally Blakemore comes to us via VIMBY and Incredible Films. Sally has been featured in past shows here at 23 Sandy and she is a dynamo, both in her books (think NASCAR pop-up) and in that awesome personality that makes her books sparkle. Watch the full video here. Find the full call for entries and prospectus for Pop-Up Now II here. 23 Sandy Gallery is pleased to announce our WANDERLUST award winners. This compelling exhibition in on view in the gallery through the end of July, so stop by soon to see the show if you happen to be in Portland. Wanderlust is a word that can mean many things, but first and foremost it conjures travel, exploration and place. This international exhibition features 56 books by 54 artists including artists from as far away as Mexico, Spain, Norway, Germany, Canada and the UK—all telling stories of near and far. Most of the selected works revolve around a strong sense of place. More than just travelogues we found deep explorations and personal transformations across destinations. These awards were selected to honor superior concept, craftsmanship and originality. All three works are well rounded, perfectly executed artist books. Congratulations to all of our WANDERLUST award winners. Selecting these awards was difficult in a show filled with so many very talented artists. WANDERLUST will be on view in the gallery through July 30, 2016. Regular gallery hours are Thursday, Friday and Saturday, from 12:00 to 6:00 p.m. Stop by soon! Click here to view the full online catalog for Wanderlust. 23 Sandy Gallery is calling for submissions to POP-UP NOW II, an international juried exhibition of pop-up and movable artist books. Pop-up books captivate and excite the child in all of us. They come to life as three-dimensional works of art hidden inside the pages of a book. POP-UP NOW II is looking for handmade artist books that pop-up, move, slide, twirl, whirl, light up, or even sound off. One of the great things about book art is the opportunity to push the definition of movable books and tackle deeper subjects. It’s easy to make a whiz-bang pop-up, but book artists are especially adept at pushing further and rounding out the book with more context. 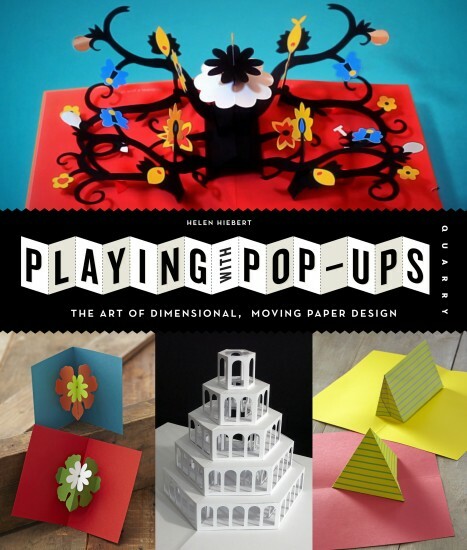 We are hoping artists will be inspired to make pop-up and movable books that tell a bigger story as well as making fantastical whiz-bang books. The gallery will award $500 in purchase prizes, plus three best of show awards. This exhibit is open to hand bound book arts related artworks created as either edition or one-of-a-kind. Artist books, sculptural books, book objects are all encouraged as long as the book has at least one interactive, movable or pop-up element. We consider popular book arts structures such as tunnel books, carousel books, flip books and many others to fit the parameters of this exhibition. Books can employ any medium, any style. POP-UP NOW II will be juried by a team of three jurors: Larry Seidman, Jim Carmin and Laura Russell.You can learn more about him at the link below. 23 Sandy Gallery is a fine art gallery located in Portland, Oregon. Open since 2007, we present local and national artists working in contemporary book and paper arts. A full prospectus and call for entries for POP-UP NOW II can be found here. Deadline for submissions is August 27, 2016. P.S. By coincidence, the Movable Book Society is holding their annual conference in Boston in September. Check out their terrific roster of speakers and events here. Click here for more information on how to shop at 23 Sandy. Scroll down for a list of artists in inventory.